In the post 10 mo SMA Method Applied To D&C Funds, Andrei and Investor generally felt the results were overly influenced by the 2008 crisis and wondered how Flack's simple timing method would perform during other drawdowns. I shared their curiosity and looked back at the past 7 down markets, defined as SP500 being down 15% or more. For this analysis, instead of using exchange traded funds, like IEF and SPY, or a specific traditional fund pair, like DODIX and DODGX, I used SP500 TR and the Barclays Intermediate Treasury TR Index, which dates back to Jan 1973. 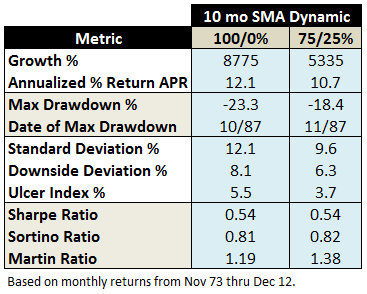 The 10 mo SMA approach mitigated all losses, except for the short-term drawdowns, like Andrei suspected, in '98 and '90, which lasted only 5 and 9 months, respectively. There was simply no protection during these sudden drawdowns, other than not being in the market...or, having wisdom and ability to just ride them out. In fact, in the four down markets where the descent or ascent was less than half the 10 month averaging period (I suppose a kind of folding frequency criteria), the 60/40 equity/bond fixed method provided the most protection. 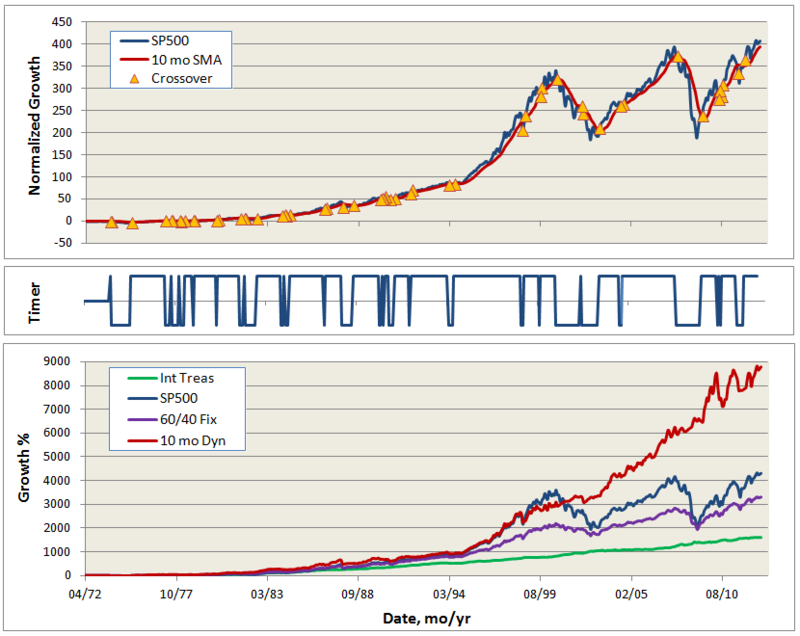 The 10 mo SMA method protected best when the periods were longest, like '74, '02, and '08. It also shortened the worst drawdown durations substantially. For the past 40 years, the longest drawdown for SP500 was 72 months, for 60/40 fixed was 50 months, but only 27 months for 10 mo SMA timing method. The analysis does point out the Achilles’ heel of the method, which we saw some of in the first post Flack's SMA Method when examining selling short instead of switching to bonds. Basically, if the market movements are too sudden compared to the averaging window, the method cannot be responsive enough. It can experience a quick fall and miss a quick rise. If these quick movements persist, the method can get out-of-sync (phase) with the market, which can result in under performance compared to fixed portfolios. But since 1973, it has delivered FCNTX-like 12.1% annualized returns with DODBX-like volatility. I remain very impressed and have decided to start employing Flack's suggestion on a portion of my portfolio, basically, for a D&C account holding. On a monthly basis, when DODGX is above its 10 SMA, I will have 75% in DODGX and 25% in DODIX. When it is below, I will reverse and have 75% in DODIX and 25% in DODGX. Not quite the all-in/all-out approach like the cases analyzed, but right for me at this time. Will compile results starting next Monday as best I can and post periodically how it's doing. Good article. Much more useful data. Are you still doing rebalancing at monthly intervals? Can you add average to the 3yr and 5yr rolling data? Finally, you chose a different strategy to employ for yourself (75-25 and 25-75). What made you decide on that? Are you going to compile results for that as well? Pretty soon, you will be turning quant. Reply to @Investor: Thanks man. Why start with 75-25 strategy? a) Compared to Flack, I'm a wimp. b) A Ben Graham-ism: "...that the proportion held in bonds be never less than 25% or more than 75% with the converse being necessarily true for the common-stock component." c) Mr. Berkowitz provides more than enough excitement for my portfolio. d) Per Catch's advice, I want to ease in, develop a timing "habit." Will get you other numbers shortly. OK, added averages to the 3- and 5-year period data. Yes, I currently plan to only re-balance at month's end, as required. The only implementation risk I see is if there is a rapid movement on last trading day of month and price is close to 10 SMA. Will compile and post based on monthly performance. Charles, this is the best work I have ever seen on this topic. I've purchased books on the subject in the past, but always came away somewhat confused and deciding it wasn't worth my time. You've shown that it can be quite simple. You came into this study with an impartial view and you let the data take you where it may. Great work. Reply to @MikeM: Thanks Mike! This one was a lotta fun. But you can blame Flack and the healthy debate he has waged with MJG and others on the MFO board. Just as coincidence, I happen to be at the end of an old text book, called "The Dow Jones-Irwin Guide To Common Stocks," by Chris Mader and Robert Hagin of the Wharton School. Dated 1976, so something I picked up in college and only now am finishing...can you believe? Anyway, these guys are heavy believers in Eugene Fama's efficient market hypothesis and for much of the book argue that you can't do better than the average market over the long haul. ...you must avoid downside losses and be in the right instrument at the right time. ...you must move out of bad investments before losses become serious. ...monitor performance relative to your expectations and cut off significant losses. I am sorry not to have seen this in real time, and must ask (surely I have missed it right in front of me), where does one find 10 SMA information online? Or do you compute it yourself? It should be simple to do this using AOA and AOK, as I can commissionfree in ML. Reply to @davidrmoran: Four your information, here is the 200 SMA for AOA & AOK. AOA and AOK don't have much history, so timing comparison not very interesting...yet anyway. Except for dip in 2011, pretty much all up after the 10-mo timer kicks-in circa 2009. I did quick look and you basically end up with equivalent of what you'd have by simply holding fixed 50/50 AOA/AOK allocation. 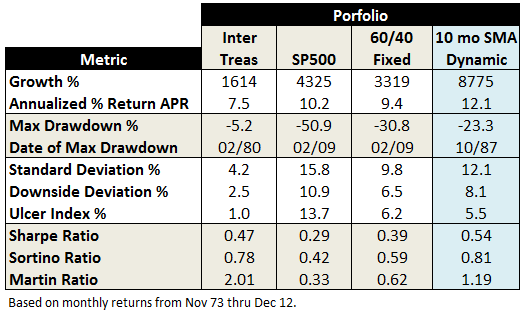 But, again, we've really not experienced an extended drawdown since their inception. Also, I see that AOA and AOK are a bit more correlated than say DODGX and DODIX. I use Excel spreadsheet to apply the method, after downloading monthly averages from Yahoo finance. Like Ted shows, Seeking Alpha also has a nice momentum tabulation of 10, 50, 200 day averages for stocks and ETFs. The 200 day average is typically considered equivalent to 10 month average. Sorry for being stupid. Did we try 9 month SMA. How about 11 month SMA? By the way there is 100 day MA, 35 week MA and 26 week EMA. Why don't we find the best fit curve in hindsight. No disrespect. Bottom line is after 10 years if it is proven this works, it will STILL not prove anything. Sorry folks. Been there, done that. One has to wait 10 years to find out if this will for the NEXT 10 years. Reply to @VintageFreak: Don't be so wishy-washy and beat-around-the -bush. If you've got something to say, damn it, just say it! device merely to protect my LT capital from a major market crash. At the time, it was not my intention to beat the market. my initial effort was directed as a LT portfolio protection plan. Make of it what you will and best of luck in the future. Very nice work. Have you tried applying this to strategy to a balanced fund (or even a 60:40 mix)? I suspect you will get less whipsaws as the trends are smoother. You may lose less during the short downturns and a shorter MA may work better to respond a little quicker to changes. shorter term momentum may look good. Sorry to write cryptically. I did not mean 10m SMA for those two ETFs, I meant using them to implement the strategy, and my real question was where does one find online 10m SMA. I just find it handy to think about using AOA and AOK strategically, since you can buy and sell many ETFs quickly and with impunity if at a commissionfree brokerage. DODGX and DODIX or any number of similar pairings would do, sure. But with mfunds you typically are constrained for short-term trading, as everyone here knows. to whatever benchmark the fund is following. You can do this on stockcharts by using the “PerfChart”. Look at the top right column under Start to Chart. and on the dropdown, click “PerfChart”. Then enter the symbol for your fund and hit “Go”. This will show you how closely your fund follows the benchmark. I’d then add $SPX to see how your fund moves compared to the S&P 500 Index. Does you fund sync with the benchmark – move up and down the same LT path. Does your fund move faster or slower than the benchmark and the S&P. I would assume that a balanced fund would move slower than the S&P. would soon do the same thing. And of course, the reverse applies. So, watching your benchmark and the S&P 500 will likely give you a heads-up. k, will do manually using yahoo; thought maybe there was a site where you just plugged in the fund symbol. using a balanced (or allocation) fund or a 60:40 stock:bond mix.